Order via Amazon above or call (949) 723-3132 and a Sjodin Communications customer service representative will be glad to assist you. Maybe you’ve been told time and time again that if you pay your dues and keep plugging away, you’ll gain enough experience through “the school of hard knocks” to be successful. That might be true. But maybe you want to reach your goals faster. Maybe you want to earn more, beat the odds — and do it with class and style. If so, it’s time to get scrappy. Scrappy people see big problems and come up with big solutions. Or they see ordinary challenges and find a new path to extraordinary results. They’re like the entrepreneur who turned his home into an indoor jungle – complete with waterfalls, tropical birds, and a live baboon – to sell investors on the now-famous Rainforest Café restaurant chain. Or the Girl Scout who skipped the usual door-to-door cookie sales and set up a table outside a medical marijuana dispensary, selling 117 boxes in just 2 hours. It can seem like these successes are just one-off acts of ingenuity or isolated flashes of brilliance… but are they? In today’s world, you need more than just an occasional burst of creativity. You need a consistent attitude, a proven strategy, and a tactical plan for execution. That’s where Terri Sjodin’s Scrappy can help you, by explaining and demonstrating the unique elements behind any successful scrappy effort. 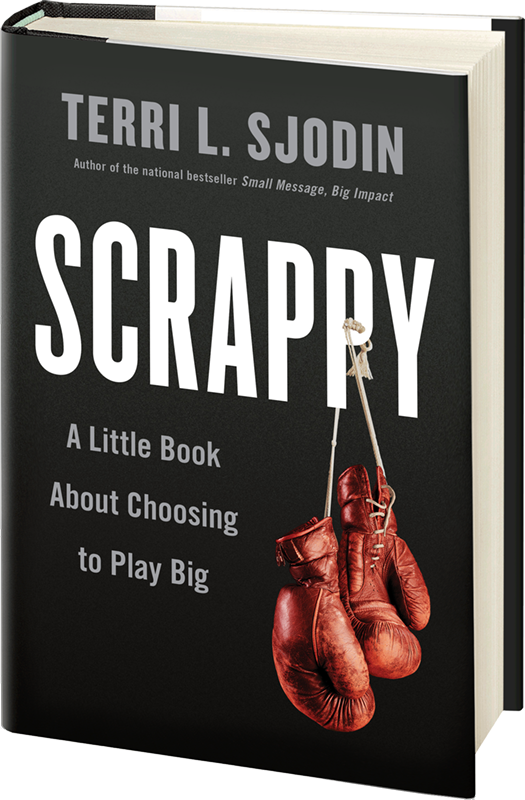 Why getting scrappy is a choice to play big. How to cultivate your best ideas. How to manage risks and bounce back from mistakes and failures. How to scale a scrappy culture within any organization, big or small.